LEGERES TRACES USURE - VERY GENTLY USED. Flocage de très grande qualité facile à poser. Made by - Nike. The shirts its a original Nike Replica. Condition - Good. ( Voir site de Mondial Relay ). Vérifiez la disponibilité d'un point relais proche de chez vous ! ( Petits fils tirés en surface flocage un peu abimé au dos ! ). 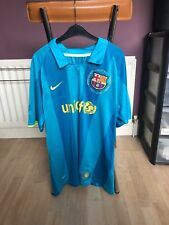 Camiseta del Barcelona de la temporada 2004/05 versión Champions League, con el dorsal dañado. Talla M. El nombre y el número se estan cayendo. GOOD CONDITION ! Faire défiler l'annonce / Scroll. 100% polyester. ( Convient pour XL ). ( Voir site de Mondial Relay ). Vérifiez la disponibilité d'un point relais proche de chez vous ! TRES BON ETAT. Marine et bordeaux. The Football Market. c'est quoi ?. Raison sociale : THE FOOTBALL MARKET SASU. FC Nantesvoir. Equipe de FranceVoir. Nos bureaux sont situés 3, place Jean Nouzille 14000 Caen. Date immatriculations RCS : 2018. Barcelone Maillot foot RonaldinhoTaille L Nike Vintage . État : Occasion mais en très bon état . Service de livraison : Lettre Suivie Paiement par PayPal ou chèque . FC Nantesvoir. Equipe de FranceVoir. Nos bureaux sont situés 3, place Jean Nouzille 14000 Caen. Id : 1461551300663. Date immatriculations RCS : 2018. SIRET : 840 635 395 00014. Raison sociale : THE FOOTBALL MARKET SASU. Features Ronaldinho 10 on the back of the Shirt. Also Features La Liga 1 and Club Sponsor on Sleeves. Material: 100% Polyester. Size: Large. RONALDINHO #10. CAMISETA / SHIRT. FC BARCELONA. I send worldwide. ) : 61 cm. edge bottom. total length (shoulder -. armpit - armpit : 44 cm. PERSONALIZZAZIONE RONALDINHO #10. MAGLIA AWAY VERSION (TRASFERTA). MAGLIA UTILIZZATA DAL BARCELLONA DURANTE LE GARE DELLA LIGA E DELLA UEFA CHAMPIONS LEAGUE 2004 2005 ( CHELSEA-BARCELONA). 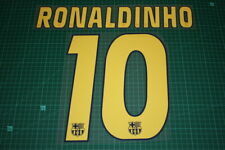 Barcelona Nike Football Shirt #10 Ronaldinho taille 44"
#10 Ronaldinho. 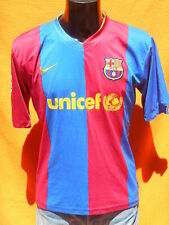 Nike Barcelona 2007/09 Away Shirt. Stitched 'LFP' sleeve patch. Made in Indonesia. Player Ronaldinho 10. Authentic Barcelona Football shirt. Made by Nike. Vinicius Jr signed photos with EXACT photo proof available for the buyer. Size is 25x20cm Price is for only one photo. If you want both, please, contact with me. Talla XL aproximada, etiqueta semiborrada. - In perfect conditions. 69 cm length. 58 cm armpit to armpit. Nouvelle annonceOfficial Nike Barcelona 2005/06 Ronaldinho Home Jersey. Official Nike Barcelona 2005/06 Ronaldinho Home Jersey.. Good condition. Size S Adult. Camiseta retro del FCB. Tallas S-M-L-XL. FCB retro jersey. Sizes: S-M-L-XL. Jerseys are too cheap. El envío tarda entre 15-20 días. Shirt does have a few small marks on the number 10. Authentic Nike Shirt.